As pro-Palestinian media members blame Israel for the recent hostilities in that part of the world, there's an incontrovertible truth being shamefully ignored: rocket and mortar attacks coming from Gaza into Israel have dramatically increased since Hamas won parliamentary elections in January 2006.
a. A dramatic increase in the extent of rocket fire and mortar shelling despite the six months long lull in the fighting: in 2008, the peak year of rocket fire and mortar shelling, a total of 3,278 rockets and mortar shells landed in Israeli territory (1,750 rockets and 1,528 mortar shells). That is a significant increase compared to 2007 (the number of landings in 2008 more than doubled) and compared to the previous years of the Palestinian terrorist campaign. b. A significant increase in the number of Israeli residents exposed to rocket fire within 40 km of the Gaza Strip: before 2008, the city of Sderot (about 20,000 residents) as well as villages around the Gaza Strip were the preferred target of rocket fire and mortar shelling. In 2008, other cities and hundreds of thousands of Israelis gradually entered the circle of fire: first the cities of Ashkelon and Netivot, and later, during Operation Cast Lead, Ashdod, Beersheba, and other cities within a range of 40 kilometers from the Gaza Strip. The rocket attacks created a new reality in which nearly one million Israeli residents (about 15 percent of the entire population) are exposed to rocket fire and mortar shelling in various levels of intensity. 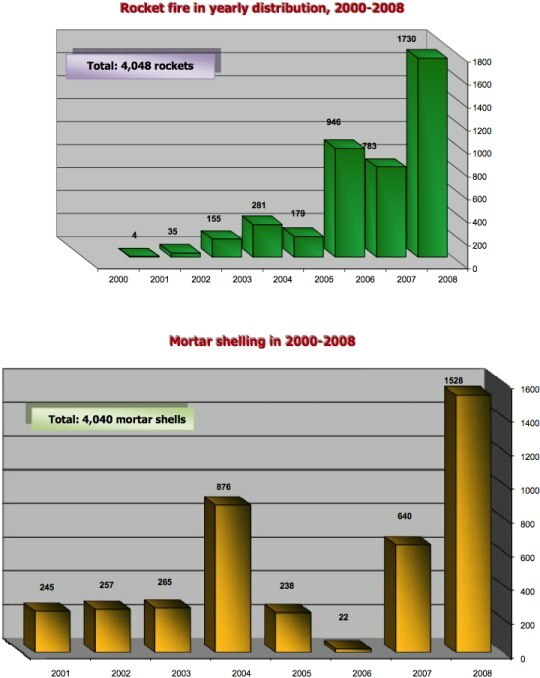 c. A significant improvement in the effectiveness of rockets and mortar shells possessed by Hamas and an increase in their quantity: in 2008, Hamas put into use 122-mm Grad launchers (for ranges of 20.4 km and approximately 40 km) and standard 120-mm mortars, which were smuggled into the Gaza Strip (in our assessment, from Iran). Those standard rockets and mortars, significantly different from self-manufactured rockets and mortars, not only increased the range of fire but also increased its effectiveness. 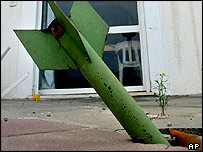 That is a result of increasing the rockets’warhead size and their fragmentation. As for the mortars—the standard 120-mm mortars are more precise and their range is greater than that of the other mortarspossessed by Hamas and the other terrorist organizations. Readers are encouraged to read the entire report and decide for themselves what our media appear to be ignoring.